A team of researchers affiliated with institutions in Argentina, the U.S. and Germany has found that there is a way to improve on the "wisdom of the crowd"—separate the people in a given crowd into smaller groups and let them talk about an issue at hand before an answer is given. In their paper published in the journal Nature Human Behavior, the group describes an experiment they carried out with a large crowd of volunteers, and what they learned from it. Most people have heard of the "wisdom of the crowd," in which individuals in a crowd are privately asked to give an answer to a question, such as how many jelly beans are in a jar. When averaged together, the answer given by the crowd will generally be better than for any given individual. Now, it appears there may be a way to improve the accuracy of a crowd. 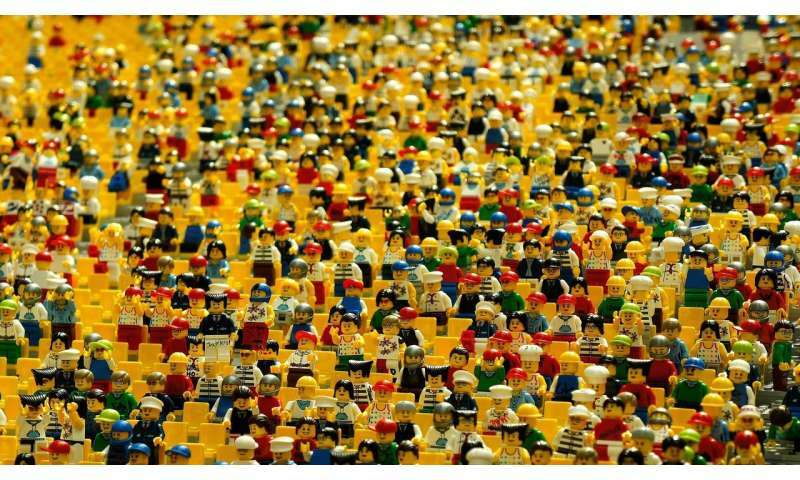 Some sociologists have suggested that allowing participants in a crowd to talk to one another before giving "wisdom of the crowd" answers would reduce the accuracy of the final average answer because it would likely lead to a herd mentality. The results of the experiment in this new effort suggest such thinking is wrong. In their experiment, the researchers asked 5180 people at a 2015 TED talk in Buenos Aires to answer several simple questions, such estimating the height of the Eiffel Tower, or the number of goals scored in the 201 FIFA World Cup. Each of the respondents was asked to give an answer privately, and then to join with a group of four other individuals to discuss the question. After one minute on each topic, each of the groups was asked for mutually agreed-upon answers to the same questions. The researchers report that the average answers of the 280 groups of five (not all of those who answered the question individually were willing to join a group) was 49.2 percent more accurate than the average crowd response as a whole. This, the team suggests, indicates that allowing some logical discussion into the equation can improve results. The aggregation of many independent estimates can outperform the most accurate individual judgement1,2,3. This centenarian finding1,2, popularly known as the 'wisdom of crowds'3, has been applied to problems ranging from the diagnosis of cancer4 to financial forecasting5. It is widely believed that social influence undermines collective wisdom by reducing the diversity of opinions within the crowd. Here, we show that if a large crowd is structured in small independent groups, deliberation and social influence within groups improve the crowd's collective accuracy. We asked a live crowd (N = 5,180) to respond to general-knowledge questions (for example, "What is the height of the Eiffel Tower?"). Participants first answered individually, then deliberated and made consensus decisions in groups of five, and finally provided revised individual estimates. We found that averaging consensus decisions was substantially more accurate than aggregating the initial independent opinions. Remarkably, combining as few as four consensus choices outperformed the wisdom of thousands of individuals. Is the true 'wisdom of the crowd' to copy successful individuals? "Crowd wisdom" - a repeatedly debunked myth. In other words a select crowd within the crowd has more expertise than the overall crowd. It's what some informed people call - "experts." The "wisdom of the crowd" equals the problem solving ability - limited by the crowds average intelligence. That avg. is far less than a select group of individuals that developed higher intelligence/greater problem solving abilities. Leaders have known this for thousands of years. It means that it's the "wisdom of the crowd" that dooms populist democracies (democracies that do not require minimum voter/issue/candidate qualifications) from providing candidates capable of competent governance. The US is concluding the final democratic experiment on the "wisdom of the unqualified crowd"/voter now - and the outcome - is obvious. The US has unqualified populist President supported by a similar Congress, both of whom perform exactly as predicted - poorly to not at all - by the crowd within the crowd. Wisdom of the crowd doesn't say that the answer of the crowd is good. It just says that such wisdom is usually better than that of one individual making a guess in seclusion. There is an experiment bias here. People that go to TED talks might be more likely to want to collaborate with each other to solve a problem. Teams performing better than individuals or statistically aggregated individuals is not very surprising. I doubt the same results would be achieved with a crowd where this is no bias towards collaboration.